This past Christmas, Santa was very generous and brought me a Blue Ant Blue Tooth Headset which espoused voice to text capabilities with a 150 dollar (on sale) price tag. While it appeared to work great, I was angry at the false advertising on the box – there is no voice to text capabilities – and thus returned it to the point-of-sale for a full refund. 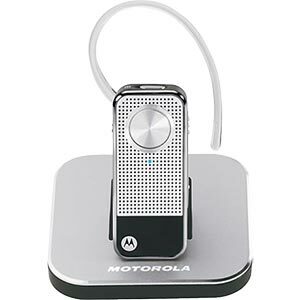 When I stumbled across the very last Blue Tooth headset at Costco, in the form of the Motorola H12 Crystal Talk, I decided to purchase it for the rather modest $59.95. It is a rechargeable headset that fits snugly and discreetly (only 1.6 inches) in the ear and boasts great sound, both in the giving and receiving. It was extremely easy to pair with my Blackberry Curve, and when left in the ear, quietly rings to which you tap the side of the ear piece and answer. It is an excellent value and comes with both a car and wall charger, as well as a carrying case and multiple ear pieces. I decided to take it one step further and install “Vlingo Plus” on my Blackberry. It is a 20 dollar application that enables the user to simply use voice commands in achieving Mobile phone communication. For example, the user could say, “Call Mary at Home” and the phone (via the headset) would do so, or the command could be, “Search Web for Japanese Restaurant”, or “Send Message to Mary”, and a text window would open to which the user could compose a text message via voice to text technology. The combination of the two systems work wonderfully and enables all the drivers of the universe to keep their eyes on the road while the mobile technology embarks on some of it’s new-age feats. This entry was posted in Tech Savvy and tagged Best Blue Tooth for money, Blue Tooth, Motorola H12. Bookmark the permalink.